Mint is great for a lot of things, but it's kind of a pain in the garden because it has no sense of boundaries and, given the chance, will spread everywhere. Which is why I, and a lot of other gardeners, usually grow mints in pots, to try to keep it at least a little bit contained. But apparently in the past somebody at my apartment building was not so cautious. Next to the patio out back, there's a few inches of grass that escaped the lawn mower this summer, and in that grass some catnip and other mystery mint has sprung up. I pulled up the shorter stalks of catnip for my kitties, but I left the mystery mint and any flowering stalks out there for whatever pollinators are still hanging around. I know there are still plenty of bees and flies, and I've seen some white cabbage butterflies and last week I saw a monarch. 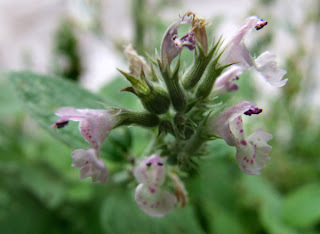 Mint flowers are tiny (about 1/4 inch) but they grow in clusters, which make for convenient nectar gathering. There aren't a lot of flowers left this time of year, and mints are good nectar sources. The catnip must be pretty primo stuff, since both the kitties went nuts over it, rolling around on the floor and tossing the catnip leaf up in the air like it was a mouse. Also, it makes Emily a little paranoid. I let both the kitties have a few fresh leaves, but most of it I just hung up to dry. The oil rubbed off on my skin and my fingers still smelled like catnip for hours afterward, and whenever I tried to pet the cats they would wrap their paws around my hand and start licking or biting me. My mother has several varieties of mint that have spread aggressively. If I were home more often this would not be a problem, because as far as I'm concerned there is an obvious solution: pesto. I planted one mint seedling a few years ago at our old house in Oklahoma. It always grew pretty well, but never spread out as much as I thought it might. When we went back to the house over Christmas vacation, we found a wild bush of mint about 2 feet by 3 feet, with some sprigs almost waist high. Circaea - For some reason, I always forget that basil is a mint. I mean, yeah, if you actually look at the plant it's obvious, but the flavor of basil is so utterly different than the flavor of, say, peppermint, and the two remain unconnected in my mind. I'm pretty adventurous when it comes to food, but I don't know that I'm up for peppermint pesto. Megan - My parents have catnip growing under some conifers in their yard; it was there when we moved in and I'm pretty sure is still there some 18 years later (although it's slowed down the past few years). If my parents stopped mowing the yard it would probably take over completely. I always wanted to dig up our entire front yard and seed it with mint. The scent would be amazing! Your post made me pick up a mint seedling at the nursery yesterday and now I already want more. Mint pesto sounds interesting. Maybe mint smashed with peas or edamame and used as a spread?